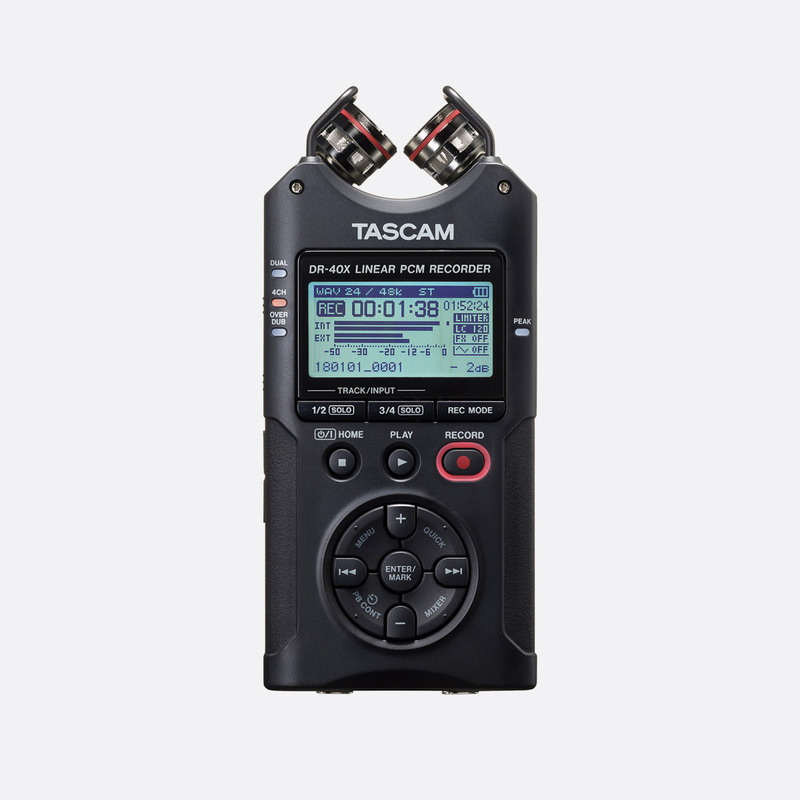 These Tascam digital audio recorders, with on-board microphones, are intended for interview, ENG, music performance and location sound recording, and can be used as handheld, desktop, or stand mounted. Powered by two AA batteries for up to 17hours of continuous use, the DR-05X is a simple and portable tool for making stereo field recordings at up to 96kHz rate and 24-bit depth, in MP3 or PCM (.WAV) format to micro SD (64MB – 2GB), microSDHC (4-32GB) or microSDXC (48-128GB) media. The inbuilt fixed AB orientated omnidirectional electret microphones handle an impressive 125dB SPL, making them suitable for capturing jet engines and heavy metal bands alike, or another source may be connected to the 3.5mm stereo jack input. The recorder has facilities appealing to musicians, as well as journalists. A Dictation Mode enables the user to jump forwards or backwards in increments preselected whilst in the process of playing back a recording. The Dictation Mode can also be combined with specific EQ to aid transcribing. Another new feature in the DR-05X is the ability to use as a USB audio interface by connecting to a compatible computer or iOS device, performing recording and playback functions with DAW or streaming software. The 128 x 64 pixel blue LCD screen allow users to view settings such as the limiter and 40/80/120Hz low-cut filter, which is switched using the device's menu-based controls. A self-timer function inserts a five or ten second delay between pressing the 'record' button, and the recording starting. A pre-recording buffer of up to two seconds can be applied to help to capture intended recordings. Recordings can be transferred to a computer via USB, using the mini-USB socket on the right side of the unit, though recording division and deletion functions easily located and performed on the DR-05X hardware. Playback is to a 3.5mm stereo jack output on the left side of the unit, or through the internal speaker. A variable speed control, from 50% to 200% of original, with pitch preserved can assist in the learning and transcription of music, especially when used with the mark, loop and repeat functions. Recording formats: WAV: 44.1/48/96kHz, 16/24bit; MP3: 44.1/48kHz, 32/64/96/128/192/256/320kbps. Microphone input: 3.5mm stereo jack, -20/-4dBV nominal/maximum. Input impedance: 18k ohms, ‘plug in pwr’ off; 2k ohms, ‘plug in pwr’ on. Response: 20Hz-40kHz, +1/-3 dB, 96kHz. Distortion: 0.05%.THD. Noise: -92dB, external input to line output. Line/headphone output: 3.5mm stereo jack, -14/+2dBV nominal/maximum, 12 ohms, 10k ohms load; 20mW maximum, 32 ohms headphones. Speaker: 0.3W, mono. USB transfer/power interface: Mini-B type, USB 2.0 high speed mass storage class. External power source: USB bus power. Internal power source: 2x AA batteries, alkaline or Ni-MH. Dimensions (w x h x d): 61 x 141 x 26mm. Weight: 119g, excluding batteries; 165g, including batteries. DR-07X is a versatile and portable tool for making stereo recordings at up to 96kHz rate and 24-bit depth, in MP3 or WAV format, to micro-SD or micro-SDHC media, either using inbuilt microphones, or by connecting another source to its 3.5mm stereo jack input. The built-in uni-directional electret condenser microphones can be moved from an X-Y position, for tight imaging, to an AB position, for a 'wider ambient sound'. All other functionality is shared with the DR-05X. Recording formats: WAV: 44.1/48/96kHz, 16/24bit; MP3: 44.1/48kHz, 32/64/96/128/192/256/320kbps. Microphone input: 3.5mm stereo jack, -20/-4dBV nominal/maximum. Input impedance: 18k ohms, ‘plug in pwr’ off; 2k ohms, ‘plug in pwr’ on. Response: 20Hz-40kHz, +1/-3 dB, 96kHz. Distortion: 0.05%.THD. Noise: -92dB, external input to line output. Line/headphone output: 3.5mm stereo jack, -14/+2dBV nominal/maximum, 12 ohms, 10k ohms load; 20mW maximum, 32 ohms headphones. Speaker: 0.3W, mono. USB transfer/power interface: Mini-B type, USB 2.0 high speed mass storage class. External power source: USB bus power. Internal power source: 2x AA batteries, alkaline or Ni-MH. Dimensions (w x h x d): 68 x 158 x 26mm, when microphones closed; 90 x 158 x 26mm, microphones open. Weight: 130g, excluding batteries; 171g, including batteries. 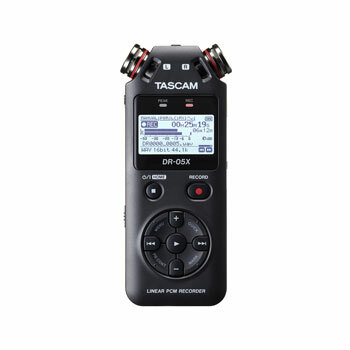 Tascam DR-22WL 2-channel (stereo) digital recorder has Wi-Fi transport control, file transfer, and audio streaming with compatible smartphones or computers. 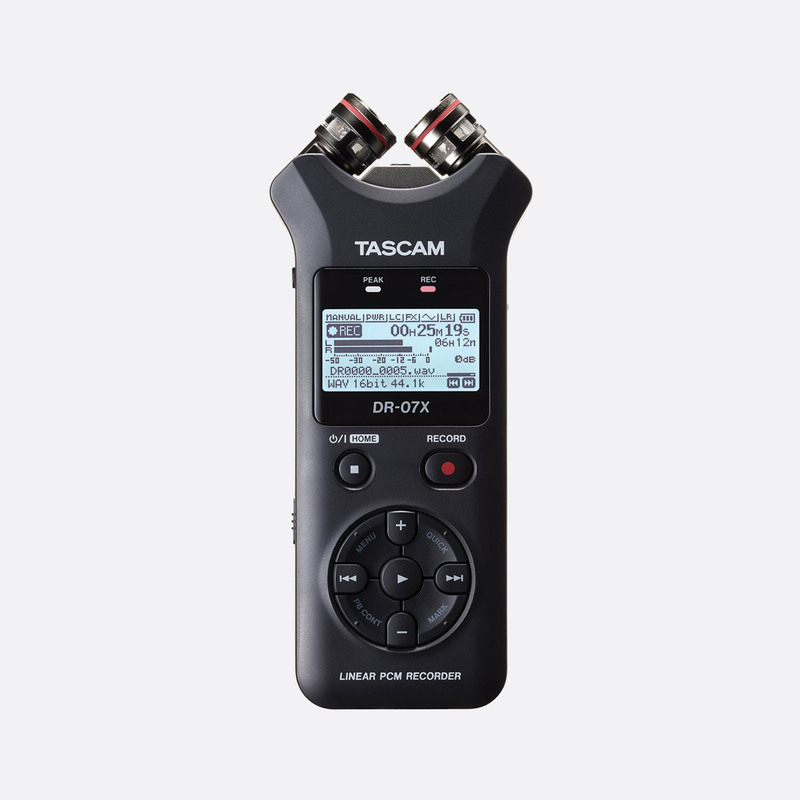 Designed for interview, live and demo situations, and sound effect gathering, fixed X-Y positioned cardioid stereo condenser microphones and a range of up to 120dB SPL means the signal captured is less likely to incur distortion and offer the best audio capture possible. Files can be recorded in either WAV at 44.1kHz/48kHz/96kHz in 16/24bit, or MP3 format at 44.1kHz/48kHz on microSD/SDHC/SDXC cards. MP3 recording bit rates of 32k/64k/96k/128k/192k/256k/320k bps are optional and playback bit rate is from 32kbps to 320kbps. A 128x128 pixel LCD screen displays useful information including live input/playback meter, time coding, record/play, and filename. The screen also displays up to four screen specific menu options relating to the four function keys to save time on navigation. A free DR Control smartphone app available from Google play for android or App Store for Apple devices. This gives the user direct and remote access to functionality including level adjustment, transport (including record and playback) controls, low-cut filter, and mixing, as well as near real time streaming audio by plugging earphones into the smartphone. The Wi-Fi connectivity, with a range of up to 20m also gives the ability to geocode the audio file from the smartphone's GPS data. Media: microSD card 64MB to 2GB, microSDHC card 4GB to 32GB, or microSDXC card 48GB to 128GB. Phones/Line out: 3.5mm stereo mini jack, -14dBV nominal, +2dBV maximum, 20mW+20mW headphone output. USB connection: Micro-B type 4-pin USB2.0. Operating time: approx. 17.5hrs recording, approx. 19hrs playback with built-in speaker using alkaline batteries; approx. 13.5hrs recording, approx. 14.5hrs playback with built-in speaker using Ni-MH batteries. Power supply: 2x AA batteries/USB bus power from a computer/Tascam PS-P520E AC adapter. Power consumption: 1.7w maximum. Dimensions: 155 x 52.2 x 36.6mm (h x w x d). Weight: 123g without batteries. 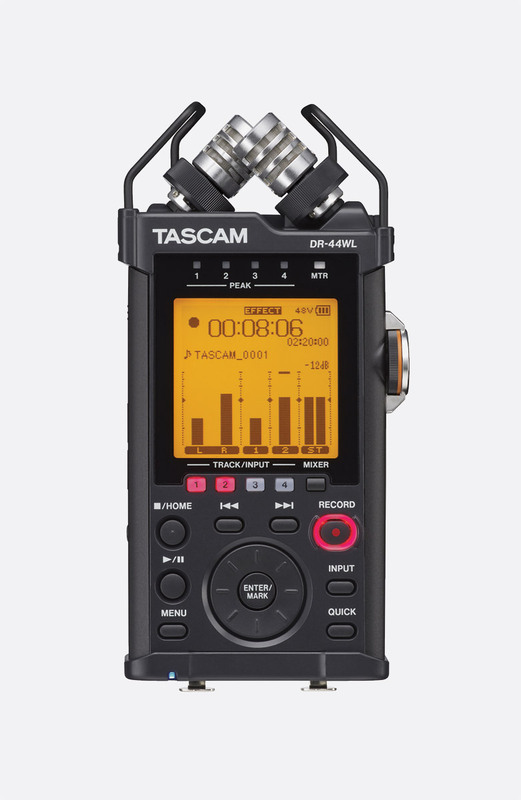 Tascam DR-40X is a versatile and portable tool for recording up to four tracks at up to 96kHz rate and 24-bit depth in MP3, WAV or BWF format, to SD or SDHC media. Audio can be captured either by using the inbuilt microphones, or by connecting additional sources to its two Neutrik XLR/6.35mm TRS jack combination inputs, which can provide +48V phantom power. 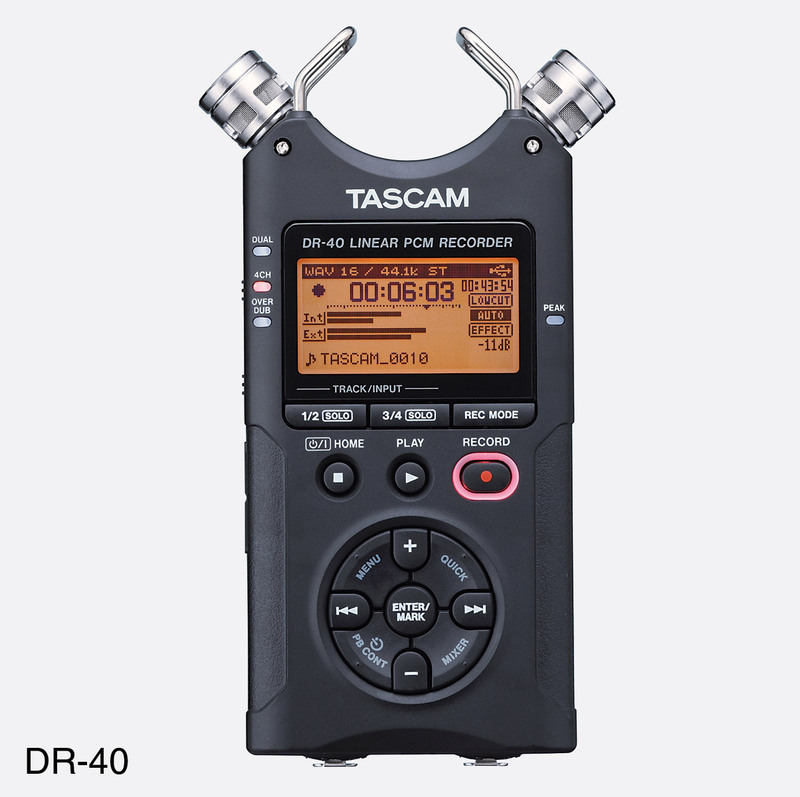 The 'dual recording' feature and the playback functionality of the DR-40X make it suitable while writing, rehearsing, recording, and performing alike. Along with the 128 x 64-pixel blue LCD display, the DR40X now features ‘one thumb’ operation for functions such as recording, adjusting levels, erasing sections and adding marks. A Dictation Mode enables the user to jump forwards or backwards in increments preselected whilst in the process of playing back a recording. The Dictation Mode can also be combined with specific EQ to aid transcribing. The dual recording feature provides two extra modes - 'Dual' mode allows the recording of one input source (mono or stereo pair) to create two concurrent files with different input level settings. The '4CH' mode uses both the internal microphones and the external inputs to record two pairs of inputs as two concurrent stereo files. This multi-tracking functionality can then be best exploited with computer editing software, when recordings have been transferred using the recorder's USB 2.0 connection. Alternatively, some editing can be performed with the DR-40X’s own functionality. The built-in, cardioid-pattern microphones can be adjusted from an X-Y position, for tight imaging, to an AB position, for a 'wider ambient sound'. The 'peak reduction' function, 'automatic level control' function, the switched limiter, and the low-cut filter (40/80/120/220Hz )are all present, as are the basic recording aids: an 'overdub' mode, which allows one to record over a previous take, while keeping the original; an 'auto record' feature, which starts and pauses recording when the audio input level crosses a definable threshold; a self-timer for delaying the start of recording; a two-second pre-recording buffer; and manual or automatic track incrementation, which can move recording into a new file without a pause. Furthermore, any of six reverb effects can be applied to the audio either during recording or playback. DR-40X transport controls are on the front face of the unit including the buttons which operate many of the menu-based graphic controls. Dedicated incremental controls for input level and output level are found on the left and front faces of the unit, respectively, and the compartment holding the SD or SDHC card is on the right face, alongside the USB 2.0 port. A photographic tripod may be fitted using the 1/4 inch BSW threaded aperture on the rear, between the internal speaker and battery compartment. The XLR/jack combination input sockets are on the bottom face of the unit, as well as the jack input for control of the unit using the optional RC-3F foot-switch or RC-10 wired remote control, which enable remote starting and stopping of playback, and other functions. WAV: 3h 22m, at 44.1kHz, 16-bit; 1h 02m, at 96 kHz, 24-bit. MP3: 37h 16m, at 48kHz, 128kbps; 14h 54m, at 48 kHz, 320 kbps. Cards with other capacities and other sample/bit rates give pro-rata recording times for each format. Recording formats: BWF/WAV: 44.1/48/96kHz, 16/24bit; MP3: 44.1/48kHz, 32/64/96/128/192/256/320kbps. Inputs: 3-pin XLR/6.35mm jack combination sockets, -19/-3dBV nominal/maximum, 2.2k ohms, microphone level; +4/+20dBu nominal/maximum, 10k ohms, line level. Response: 20Hz-40kHz, +1/-3dB, 96kHz. Distortion: 0.05% THD. Noise: -92dB; external input to line output. Line/headphone output: 3.5mm stereo jack, -14/+2dBV nominal/maximum, 12 ohms, 10k ohms load; 20mW maximum, 32 ohms load. Speaker: 0.3W, mono. USB transfer/power interface: Mini-B type, USB 2.0 high speed mass storage class. External power source: USB bus power; PS-P520E AC adaptor. Internal power source: 3x AA batteries, alkaline or Ni-MH. Dimensions (w x h x d): 70 x 155 x 35mm, with microphones closed; 90 x 155 x 35mm, with microphone pair open. Weight: 213g, excluding batteries; 282g, including batteries. 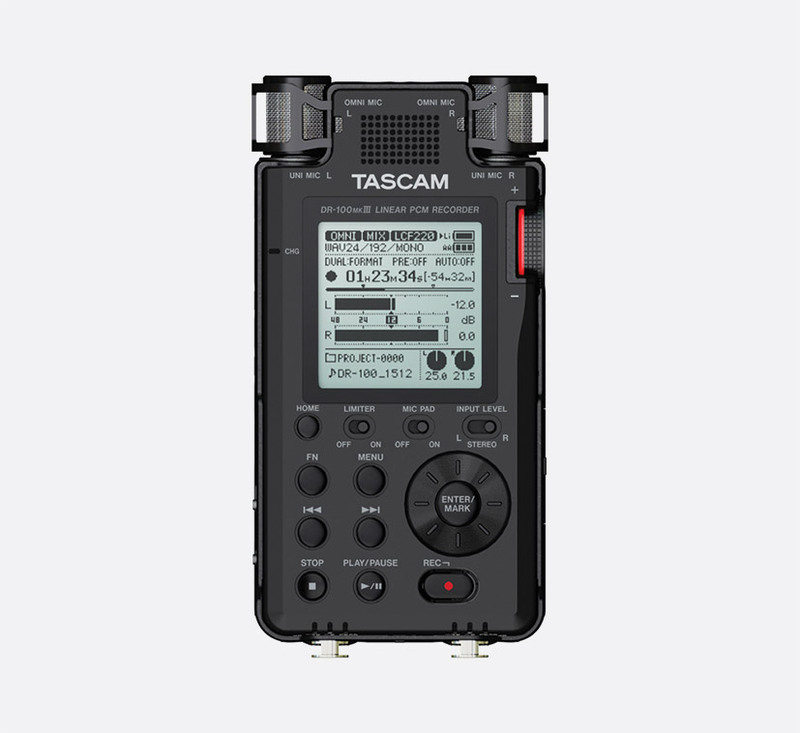 Much like the DR-22WL 2-channel (stereo) digital recorder, the Tascam DR-44WL 4-channel portable recorder has remote Wi-Fi for transport control, file transfer, and audio streaming with compatible smartphones or computers. Designed for interview, live and demo situations, and sound effect gathering, fixed X-Y positioned cardioid stereo condenser microphones and a range of up to 132dB SPL means the signal captured gives the user a wider range of quality recording. Using the built-in microphones and/or microphones connected to either or both of the two balanced/unbalanced XLR combo jacks at either +4 or -10 levels, offers the user up to four channels of mono recording in formats of two stereo files, or one stereo and two mono channels. +48V phantom power is supplied to condenser or ribbon microphones that require it. A free to download DR Control smartphone app available from Google play for android or App Store for Apple devices. This gives the user direct and remote access to functionality including level adjustment, transport (including record and playback) controls, low-cut filter, and mixing, as well as near real time streaming audio by plugging earphones into the smartphone. The Wi-Fi connectivity, with a range of up to 20m also gives the ability to geocode the audio file from the smartphone's GPS data. Phones/Line out: 3.5mm stereo mini jack, -14dBV nominal, +2dBV maximum, 20mW+20mW headphone output. USB connection: Micro-B type 4-pin USB2.0. Operating time: approx. 16hrs recording when Mic input selected without phantom power; approx. 12hrs recording when Mic input selected without phantom power. Power supply: 4x AA batteries/USB bus power from a computer/Tascam GPE053B AC adapter. Power consumption: 2.5w maximum. Dimensions: 79 x 162.2 x 42.5mm (l x w x h). Weight: 251g without batteries. Included accessories: Windscreen, mic grip, shoe mount adapter, AC adapter, case, USB cable, SD card adaptor, 4GB microSD card, owner's manual (including warranty). 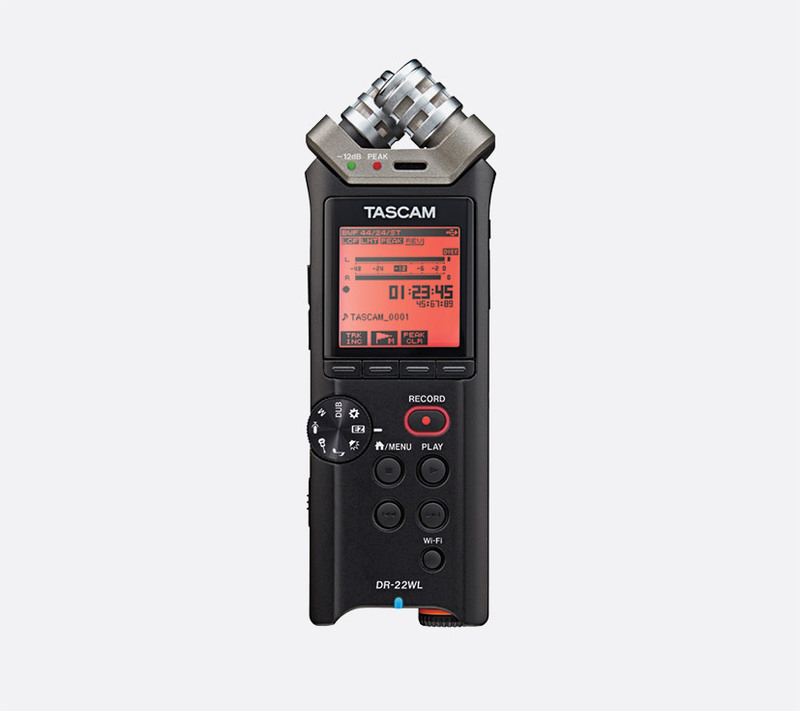 Tascam DR-100MKIII handheld linear PCM recorder with built in omnidirectional and unidirectional microphones was designed for location recording of spoken voice, ambient noise, or performance. Two balanced locking XLR/TRS inputs, 2k ohms impedance for Mic and 20k ohms impedance for line, on the bottom of the digital recorder can be used to connect external microphones, providing +48v phantom power if required. A switch operated mic pad can be used to reduce the maximum input level from -70.5dBu to +2dBu if the input signal is too high. The aluminium bodied stereo 2-channel recorder can record both WAV and MP3 file formats in FAT16/32 simultaneously to provide the user with both full resolution and compressed file that uses less file size making posting to social media sites more accessible. The DR-100MK3 also has a dual level recording function that allows the user to records a secondary, 12dB reduced level file to protect from any unexpected signal overload. Using two AD converters in tandem a signal to noise ratio of 109dB can be achieved, while recording in standard mode 102dB signal to noise ratio is normal. Recording operation time (recording at WAV 44.1kHz, 16-bit): approx. 12hrs built-in mics, 6hrs Mic In with +48v, built-in lithium-ion rechargeable battery; approx. 2hrs built-in mics, 1hr Mic In with +48v, alkaline batteries; approx. 3.5hrs built-in mics, 2.25hrs Mic In with +48v, Ni-MH batteries; approx. 7hrs built-in mics, 3hrs Mic In with +48v, lithium-ion batteries. Analogue output: 3.5mm stereo mini jack line out, 200ohms. Output level: -14dBV, nominal output level; +6dBV, maximum output level. Headphone outputs: 3.5mm stereo mini jack, better than 40mW+40mW (32ohms loaded) maximum output. USB: micro-B type, USB 2.0. Dimensions: 80 x 155.7 x 35mm (w x h x d). Weight: 375g without batteries. Operating temperature: 0 to 40degrees Celsius. Optional accessories: PS-P520E AC adapter and external battery pack BP-6AA. BP-6AA is an external battery pack that mounts to the bottom of a USB powered handheld recorder using a tripod screw and attaches to the handheld recorder through the USB cable. Since the BP-6AA itself has a tripod connector, the assembly can then be mounted to a tripod. The pack takes six AA alkaline or Ni-MH batteries, and increases the battery life of the DR-40, for example, to over 50 hours of recording. It is also suitable for other products powered by DC 5V or USB and can be used with 'any Tascam product powered by PS-P515U, PS-P520 AC or PS-P520E adapters or any product powered by USB'. The case has an on-off switch, a USB Type A output connector (power only) and a compartment for the batteries. Dimensions: 66 x 114 x 29 mm. Weight: 136g, excluding batteries.